Andy Murrayâ€™s stated intention in entering the Thailand Open was to make sure he had recovered from his jet-lag before the two higher-profile tournaments in China over the next fortnight. Some thought that his attendance at a non-compulsory tournament failed to square with his recent complaints about an overloaded schedule. 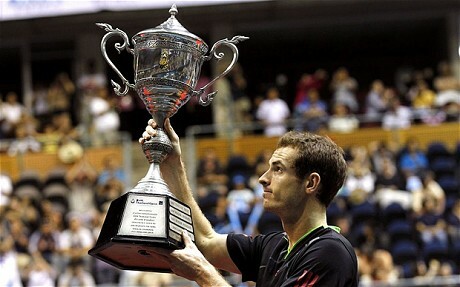 But whatever the arguments over player burnout, Murray looked in fine fettle on Sunday as he dispatched Donald Young 6-2, 6-0 in the Bangkok final to wrap up his third title of the season. This was a resounding conclusion to a fine weekâ€™s work, even if Murray was the top seed for the tournament and Young â€” ranked 55 in the world â€” was appearing in his first ATP final. These two met in the fourth round of last monthâ€™s US Open, with the same result, but Sunday’s match was even more conclusive than that 6-2, 6-3, 6-3 win at Flushing Meadows. Although Young describes his win over Murray in Indian Wells in March as the high point of his career thus far, that was at the point of the year when Murray was still recovering from the disappointment of the Australian Open final. Since then, he has come back strongly and performed well on all surfaces â€” clay, grass, hard-court and now indoors, which is probably his strongest suit. Indeed, from April onwards, he has only lost one match that he would have been expected to win â€” against Kevin Anderson in Montreal at the start of his American hard-court season. Otherwise he has been note-perfect against every lower-ranked opponent, and his win-loss ratio over that period â€” 36 to five â€” is impressive. Only Anderson, Novak Djokovic and Rafael Nadal (three times, in three grand slam semi-finals) have been able to stop him. In Bangkok, Murray had a relatively smooth run in his four outings, and was only pushed to three sets once, by the 12th-ranked Gilles Simon in the semi-finals. This weekâ€™s China Open in Beijing will be a more demanding tournament, and then the Shanghai Masters the following week is another step up again. But there will be opportunities to add to his growing stack of points this year, because Roger Federer has already announced his absence from both tournaments as he â€œrests and recuperatesâ€ from a demanding summer, while Novak Djokovic has pulled out of Beijing with the back injury he sustained in the US Open final and must also be considered a doubt for Shanghai. There may be no more grand slam tournaments this year, but if Murray continues on his current trajectory, he should be able to attain another of his goals, which is to overtake Federer and move to No 3 in the rankings.